Exercise Physiology for Health Fitness and Performance 4 Edition Updated for its Fourth Edition with increased art and photos, this undergraduate exercise physiology textbook integrates basic exercise physiology with research studies to stimulate learning, allowing readers to apply principles in the widest variety of exercise and sport science careers. 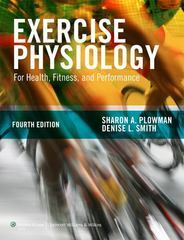 The book has comprehensive coverage, including integrated material on special populations, and a flexible organization of independent units, so instructors can teach according to their preferred approach.Each unit is designed with a consistent and comprehensive sequence of presentation: basic anatomy and physiology, the measurement and meaning of variables important to understanding exercise physiology, exercise responses, training principles, and special applications, problems, and considerations.Plowman & Smith provides a consistently organized, comprehensive approach to Exercise Physiology with excellent supporting ancillary materials. Its ability to relate up to date research to key concepts and integrate special populations makes this book ideal for classroom use.